In yoga it is generally useful to acquire basic skills of mind-body coordination, so that the poses seem more accessible and less threatening. However, it becomes even more important when we are working with specific injuries and are trying to modify our habitual movement patterns. If your body is used to moving a certain way, but that pattern of movement is creating pain, instability or imbalance, you can effectively use your yoga practice to modify those movement patterns. But, as you can imagine, changing the already entrenched movement patterns is no easy task and requires a lot of repetition. This is one of the reasons that we often recommend that students establish a consistent personal home yoga practice – over time it helps to replace old, dysfunctional movement patterns with new, more beneficial ones. Here is a tricky part though. Often students are encouraged to do their yoga practice first thing in the morning. For many students this means waking up earlier to have time for their yoga before other demands of the day kick in. Unfortunately, Matthew Walker had demonstrated that improvements in the motor memory “were directly related to the amount of stage 2 NREM (deep sleep), especially in the last two hours of an eight-hour night of sleep.”(1) This means that if you are cutting your sleep short to get up and do your yoga routine, your brain will not have time to improve and strengthen your motor memory from the day before. So instead of using your sleep to assist you in your practice efforts, you will be undercutting them. Another unfortunate side effect of shorter sleep time is the risk of injury. A research study of competitive young athletes in 2014 demonstrated that chronic lack of sleep dramatically increased the risk of injury. Most of us are not competitive athletes, but the same principles apply to all of us, as well. Lack of sleep generally increases the risk of injury, especially when you are physically challenging your body. Here is the bottom line: If you are trying to resolve muscle tension or decrease physical pain in your body, it is very useful to regularly practice a short therapeutic routine designed specifically for you by a qualified professional (physical therapist, yoga therapist, etc.). And to make sure that this new movement pattern becomes the default pattern for your body, you need to get at least 8 hours of sleep to allow for those motor memories to be processed and integrated by the brain. This will also significantly decrease the risk that you will re-injure yourself. Next time we will take a look at what lack of sleep does to your emotions (and it’s much more than just making you grumpy). Tune in! 2. 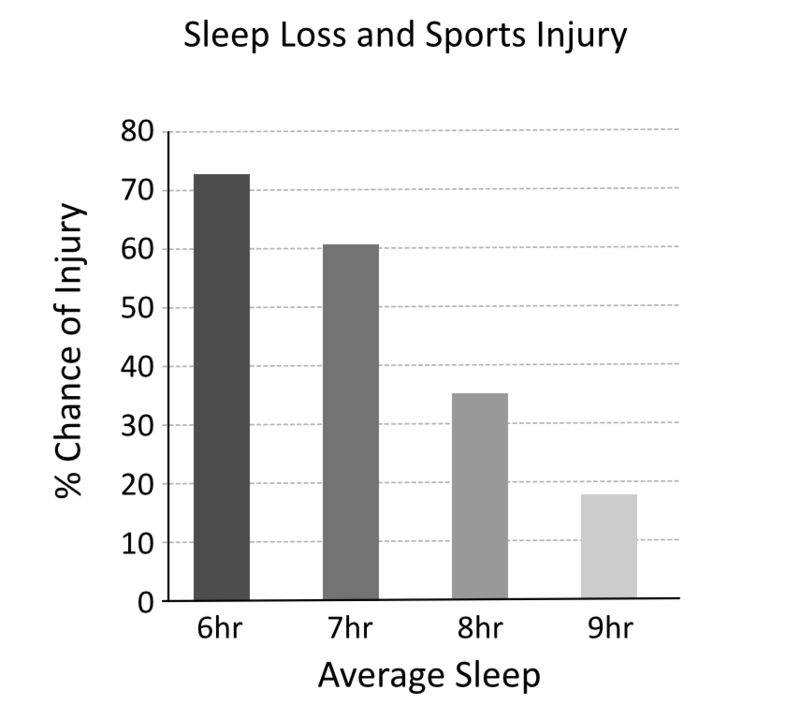 Chronic lack of sleep is associated with increased sports injuries in adolescent athletes by M. D. Milewski et al. Early to bed and then morning Yoga practice. I like your blog posts very much its a bit misleading to give just one scenario – sleep deprived yoga practice – and say it is best to avoid it. I practice Yoga asanas every morning and, just light body movements to wake it up. It works wonders how the day is so much more improved. On this I agree that morning and evening practices need to be different. However, I didn’t see that mentioned, only derived. Thank you for your comment! I completely agree – going to bed early and getting up early to practice can work very well. This is why I wrote several times that it is about getting at least 8 hours of sleep, not about the specific time when you decide to practice. Thank you for reading! nice post! sleep is very important, ando sometimes i´ve heard yoga teachers recommending waking up at 5 am to do yoga. That may not work for everyone! Previous story Does sleep help you to remember or to forget?